International crude oil and liquefied fuels movements depend on reliable transport through key chokepoints. In 2011, total world crude oil and liquefied fuels consumption amounted to approximately 88 million barrels per day (bbl/d), and more than one-half was moved by tankers on fixed maritime routes. Chokepoints are narrow channels along widely used global sea routes, some so narrow that restrictions are placed on the size of the vessel that can navigate through them. The map shows chokepoints that are critical areas for global energy security because of the high volume of oil that moves through waterways. The Strait of Hormuz, located between Oman and Iran, is the world's most important oil chokepoint due to its daily oil flow of about 17 million bbl/d in 2011, roughly 35% of all seaborne traded oil and almost 20% of oil traded worldwide. More than 85% of these crude oil exports went to Asian markets, with Japan, India, South Korea, and China representing the largest destinations. The blockage of the Strait of Hormuz, even temporarily, could lead to substantial increases in total energy costs. Among the major oil exporters that ship oil through the Persian Gulf, only Iraq, Saudi Arabia, and the United Arab Emirates (UAE) presently have pipelines to bypass Hormuz, and only the latter two countries currently have unutilized pipeline capacity on these pipelines. At the start of 2012, the total unused pipeline capacity from Saudi Arabia and the UAE combined was approximately 1 million bbl/d. The amount available could potentially increase to 4.3 million bbl/d by the end of this year, as both countries have recently completed steps to increase their capacity to bypass the Strait (see table). Notes: All estimates are as of August 17, 2012 and expressed in million barrels per day (bbl/d). 1Although the Kirkuk-Ceyhan Pipeline has a nominal nameplate capacity of 1.6 million bbl/d, its effective capacity is 0.4 million bbl/d because it cannot transport additional volumes of oil until the Strategic Pipeline to which it links can be repaired to bring in additional volumes of oil from the south of Iraq. 2"Unused Capacity" is defined as pipeline capacity that is not currently utilized and can be readily available. 3All estimates for 2012 are rates around the mid-year point; not the forecast average for 2012. 4Throughput rates for 2012 are assumed to be the same as average throughput rates in 2011. Iraq cannot send additional volumes through its Kirkuk-Ceyhan (Iraq-Turkey) Pipeline to bypass the Strait of Hormuz unless it receives more oil from southern Iraq via the Strategic Pipeline linking northern and southern Iraq, but portions of the Strategic Pipeline are currently inoperable. Saudi Arabia recently increased its additional unused pipeline capacity to 2.8 million bbl/d when it converted one of the two pipelines connected to the Petroline system back to transporting crude oil. The UAE recently opened a 1.5 million bbl/d Abu Dhabi Crude Oil Pipeline, which runs from Habshan, a collection point for Abu Dhabi's onshore oil fields, to the port of Fujairah on the Gulf of Oman, allowing crude oil shipments to circumvent Hormuz. 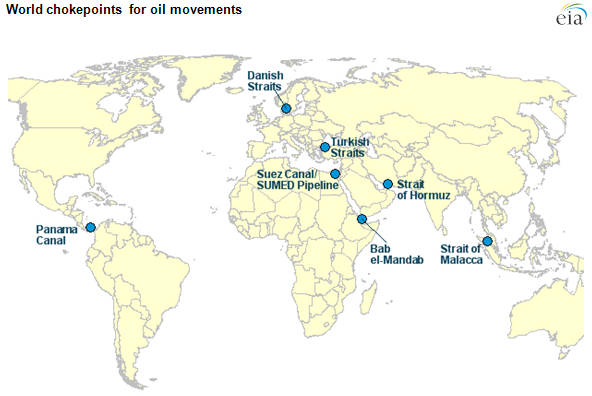 EIA's World Oil Transit Chokepoints analysis brief contains additional information on Hormuz and the other chokepoints, and the Middle East & North Africa overview contains additional information about countries in the region.